Like a lot of app makers, the folks behind Waze are itching to add support for Siri to their iPhone and iPad app. But with Apple not yet providing such access, the developers decided to take matters into their own hands. Wave your hand in front of your iPhone when it’s running Waze, and the phone’s proximity sensor will activate voice command features. The latest update to Waze, rolled out to the App Store Thursday, introduces a voice-command feature to the crowd-sourced traffic and navigation app. Version 3.1 of Waze takes advantage of the proximity sensor in the iPhone—the sensor that normally detects when your face is close to the iPhone’s screen during phone calls—to let you report traffic incidents or calculate routes using your voice. That’s a critical addition to Waze, an app that’s generally in use when people are driving. Waze turns to its users to provide traffic data on accidents, construction, and other delays; the app provides game-like incentives to encourage users to share that data. Interacting with the app is easy enough if you’ve got a passenger in the car to man the touch controls, but for solo drivers, any tap can be an unwanted distraction, particularly as more states insist upon hands-free operation of phones when driving. Thus, Waze had a lot of incentive to come up with a workaround for adding some measure of voice control. 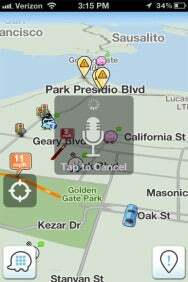 Waze turned to the OpenEars open-source library for adding speech recognition to its app, tying that feature in with the proximity sensor in the iPhone. Wave your hand in front of your phone when Waze is running, and it activates the voice-control features. You’ll be prompted to speak commands without having to tap your phone’s screen. Those commands include the ability to report traffic. The app recognizes descriptions of heavy, moderate, and standstill traffic. You can also tell the app to calculate your route using Home or Work as bookmarks. Waze plans to evaluate how that feature performs, with an eye toward adding future location bookmarks down the road, according to Habdank-Kolaczkowski. Because it relies on the proximity sensor, the voice-command features in Waze 3.1 aren’t available to iPod touch and iPad users. However, they will work with any iPhone model since the 3G—at this time, Siri voice-control features are limited to the iPhone 4S. The new version of Waze introduces several other features. Users can now let other people know where they are on their trip as well as an expected arrival time. The update includes a redesigned navigation list offering text-based instructions for a route. Waze 3.1 also improves Bluetooth support and includes several unspecified bug fixes. The app is a free download from the App Store.